Hurricane Maria made landfall in Puerto Rico early Wednesday morning as a category 4 storm. With winds measuring 155 miles per hour, by mid-day local media were reporting that all of Puerto Rico had lost power. The whole island, home to 3.4 million people, is currently under a flash flood warning, and the National Weather Service in San Juan is advising people to move to higher ground. While it will be difficult for most people to move to safety, it will be harder still for people who are incarcerated in Puerto Rico’s 29 territorial and federal prisons. 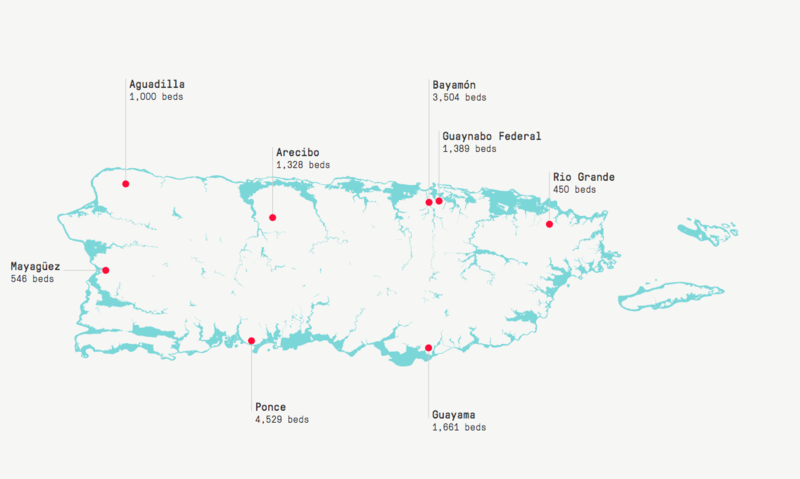 As you can see from our map, the prisons are clustered around eight complexes across the island, most along the coast and near high-risk flood areas. During last month’s flooding in Houston following Hurricane Harvey, nearly 6,000 inmates in five Texas prisons were evacuated. The same happened in south and central Florida, where over 7,000 prisoners were moved across the state in anticipation of Hurricane Irma. Puerto Rico was still recovering from Hurricane Irma, less than two weeks ago, which spared the island the brunt of the fierce weather but did leave mounds of debris and about 63 percent of the island, about 1.5 million power clients, without electricity. Now Hurricane Maria has cut off communication with most government officials and the rest of the residents. It is not known yet if prisoners have been evacuated or relocated in Puerto Rico. The Department of Corrections and Rehabilitation stopped allowing family visits and halted the movement of prisoners on Monday in anticipation of the storm, according to the department’s Facebook page. In that announcement, Corrections Secretary Erik Rolón Suárez said prisoners were not going to be moved unless it was an emergency, following the same procedures the department took during Hurricane Irma. Worried families have been posting urgent pleas for information on the DCR’s Facebook page, without response. Calls and emails to the Puerto Rican department of corrections were not returned, with the island under a state of emergency and without power. "We're looking at four to six months without electricity,” San Juan Mayor Carmen Yulín Cruz told MSNBC. The only federal prison in Puerto Rico, MDC Guaynabo, is located in the northern part of the island and currently houses 1,389 inmates. Guaynabo converted to generator power at 6 p.m. Tuesday, according to a Bureau of Prisons statement posted today,when the main power in Puerto rico was shut down. Those housed in Guaynabo are all accounted for and had sufficient food and water for staff and inmates, according to the statement. Because power, communications and internet services on the island are down, it’s unclear how many people are being held in Puerto Rican state prisons, but the facilities can house more than 12,000 prisoners in total. 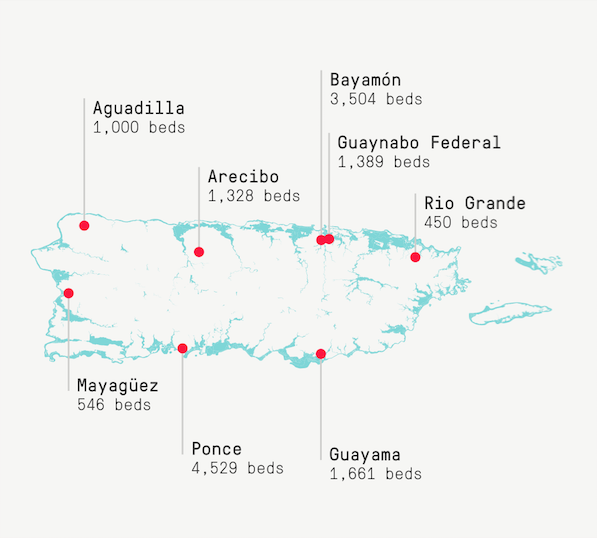 The biggest prison complexes are in Ponce, in the southern part of the island and Bayamón, near San Juan in the north, with 4,529 and 3,504 beds respectively. Source: FEMA special flood hazard areas, Puerto Rico Department of Corrections.